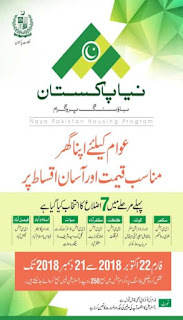 ISLAMABAD - Prime Minister Imran Khan will launch a pilot project of the 'Apna Ghar' plan on Wednesday 11-Oct-2018 to take a step towards realizing its commitment to provide 5 million homes to citizens at affordable prices in five years' time. The Pakistani Tehreek-e-Insaf (PTI) promised to deliver homes to homeless people across the country in its election manifestation if it were to vote for power. Now it is going to launch the pilot projects of the scheme in all four provinces and Gilgit-Baltistan in the first phase. Registration form / application form will soon be published by NADRA. While the first step of this housing plan is to check the requirement of the people of Pakistan who want to get the constructed houses. Initially a district of Punjab, Khyber Pakhtunkhwa (PKP), Sindh, Balochistan, Gilgit Baltistan (GB) and Azad Jammu and Kashmir (AJK). While the 7th district will be the Islamabad territory. Survey phase will be held in two months. While Naya Pakistan Housing Authority will be formed in the next three months. Public areas will be chosen from all parts of Pakistan for the location of housing projects. Faisalabad, Sukkur, Quetta, Dera Ismail Khan, Islamabad, Gilgit and Muzaffarabad.